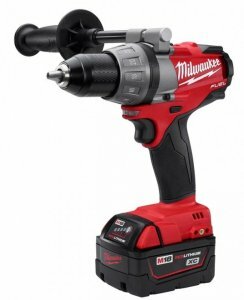 The evolution of tool technology continues to impress, and Milwaukee is leading the charge with their latest line of cordless drills. Their new M18 FUEL line features the latest in drill technology, yet still manages to remain affordable to tradesman. So what makes the M18 FUEL line so special? How about better power, longer run times and long tool life? Brushless motors are making their way into more and more tools, and if your new tool doesn't have them, then you are missing out. Powerstate is what Milwaukee has named their brushless motor technology and it has found a nice home in the M18 FUEL drills. The benefits of Powerstate include 10x longer life, 25% more power and 50% more runtime. What does this mean in real numbers? How about 725 in-lbs of torque. Reduced noise and cooler running tools are also a benefit of brushless motors. The M18 FUEL line offers a lot of power, but it does so in a drill body that is shorter and lighter than the competition. I was impressed with the size of the latest Bosch hammer drill, but the Milwaukee beats it by about 7/8-inch. This drill has brawn, but it also has the brains. Milwaukee's REDLITHIUM batteries and the new REDLINK PLUS intelligence system is used to allow the drill and the batteries to communicate during operation to make sure you are getting the most out of the tool. The same communication goes on between the battery and the charger during the charging process. One major problem people had with some first generation lithium-ion batteries was cold weather use. REDLITHIUM batteries are rated operate in temps as low as 0°F/-18°C , so I guess this problem has been taken care of. A fuel gauge on the front of the batteries is a nice bonus. The Milwaukee M18 FUEL drilld are on Amazon now and they start at around $230 for a 1/2-inch drill with compact batteries and go up to $299 for a 1/2-inch hammer drill with high capacity batteries. Are you going to go out and buy one?